IT management is a highly specialized field. Technology is advancing in leaps and bounds so trying to manage your own network is often like car mechanic trying to diagnose an illness. You may get part of it right, but when it comes to the details, you will be sorely lacking. Outsourcing your IT needs to a company that specializes in this type of work provides benefits far and above what you will actually pay for their services. They will be able to identify problems and apply solutions before you ever realize something wasn’t right. Managed IT services means no more guesswork. Trying to troubleshoot a problem with little working knowledge of the system you are dealing with could be a recipe for disaster. Hiring the right IT management team ensures you that any issue that you experience is in the capable hands of a team of highly trained professionals. They can identify the problem, correct any issues that result from it, and then work proactively to ensure the issue doesn’t become a problem in the future. When it comes to working within the cloud, they have that covered too. They can create a network where everyone has what they need to be productive without wasting a lot of time trying to figure out how to manage the system. An IT management team includes technicians who are certified to do the job. When it comes to building and maintaining a network within the company, they can do that. If your system contains confidential information that needs to be encrypted, they can do that to. A managed service provider can help keep your internal network and cloud running smoothly. When your company starts to grow and you need to expand your network, your MSP can evaluate what your exact needs are and build onto your current system. IT systems require a level of specialized training that you may not even know exists. This is why when it comes to your IT needs, you manage your business and let the trained professionals handle the technology. When you use a computer, you will often see a notification about a new update or upgrade that is needed for your software to run properly. The same is true of your IT system. Having a qualified team of IT professionals at your service will ensure updates/upgrades are installed promptly and correctly every time without you having to worry whether or not you have missed one or if your system is fully up to date. Hiring an IT team will also ensure that you have sound security protocols in place that will reduce your risk of a cyber attack. An MSP will often back up your data on a daily basis to ensure that nothing is ever lost and that your system will still be operational if a virus or other type of malicious software works its way inside. Along with protecting your business from disaster or technical failure by maintaining data storage with secure backup protocols, your IT team may implement additional layers of security that are less commonly known or not something achievable with the do-it-yourself approach. 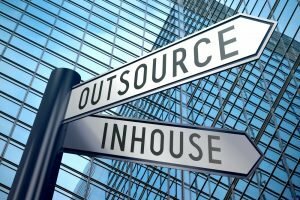 One thing that you must remember when outsourcing your managed IT needs, the company you hire should work with you not just for you. While many companies will meet basic standards, the best service providers go above and beyond the basics and you’ll have a sense of being able to trust them. Their knowledge and experience can be used to guide you when it comes to assessing your IT needs and how they can impact the general health of your business. The outcome is a relationship that has you working hand in hand with them for a business IT environment that ensures maximum efficiency and optimum security.